SENRUG wants to city an inter-city service call at Morpeth every 2 hours throughout the day, in each direction. These services would be provided by a mixture of East Coast and CrossCountry, both of whom run inter-city services between Newcastle and Edinburgh (East Coast service to and from London and CrossCountry services to and from the South West and Birmingham). Morpeth is a busy market town with a population of approx 15,000 but additionally serving a wider community of outlying villages. It is also the administrative centre for the county of Northumberland. A number of businesses are based in South East Northumberland and need good reliable access to commercial centres such as London, Birmingham, Leeds and Edinburgh. The inter-city trains that currently stop at Morpeth are well used, sometimes with as many as 50 passengers getting on and off, and SENRUG believes extra stops would be commercially viable for the train operators. It would particular help them to fill seats on journeys such as Morpeth – Edinburgh, where trains are often less lightly loaded. Although there is now a reasonable selection of inter-city trains in Monday to Friday peak hours, inevitably these do not normally have cheaper advance purchase seats available on them, making them unattractive for leisure passengers. It’s fairly easy for an operator to let trains that currently pass through Morpeth without stopping make a call at Morpeth instead. 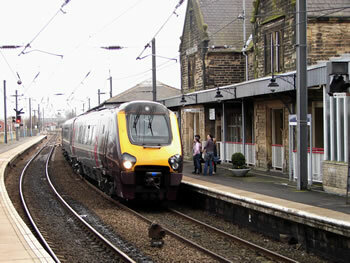 In some cases there are three inter-city trains running between Newcastle and Edinburgh within 20 minutes. These do not all need to run non-stop. The train operators currently favour a “skip stop” pattern where a train that does make intermediate calls serves only one, or possibly 2 of the four intermediate stations. SERUG proposes one train could be designated to serve all the intermediate inter-city stations (Morpeth, Alnmouth, Berwick and Dunbar) whereas the others could run non-stop. This would also permit travel between these stations, something which is not possible currently throughout most of the day. Morpeth station is on a tight curve and trains have to slow down anyway. Actually stopping at the station does not add that many more minutes. Particularly at weekends, some trains that do not stop at Morpeth are held at Edinburgh or Newcastle for timetabling reasons. This time could easily be used to allow an extra stop at Morpeth. SENRUG has written to both East Coast and CrossCountry listing details of the additional services that could stop at Morpeth. A particular failing of the current franchising regime is that neither the operator nor Department for Transport considers the joint timetable as a whole for sections of the route served by both operators, leading to the situation we have today where two trains from different operators chase each other up the line, neither making calls at key intermediate stations. Following intensive lobbying from SENRUG, Virgin Trains East Coast will add a further 2 stops in each direction at Morpeth on Mondays to Fridays from December 2016. CrossCountry will be similarly adding 2 extra services each way at Morpeth (every day of the week from December 2017. From December 2019, TransPennine Express will introduce an hourly service each way at Morpeth on the Liverpool – Manchester – Leeds – York – Durham – Newcastle – Edinburgh route, giving Morpeth an hourly service each way to these cities. And in December 2021, First will also introduce an open access service between Edinburgh and London, stopping only at Morpeth and Newcastle (some trains will also call at Stevenage) giving Morpeth an additional 5 trains daily to Edinburgh and to London. These additional services, when takentogether, fully achieve SENRUG’s objective for more inter-city trains at Morpeth.